Click to download registration brochure. 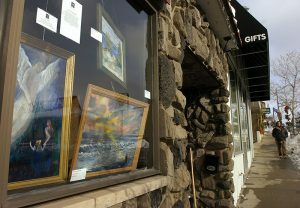 The Ely ArtWalk invites you to participate in the annual eleven day art show held during the Ely Winter Festival. 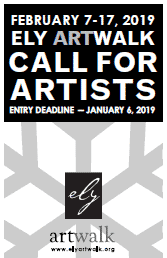 Artists residing in Ely and surrounding communities are invited to participate. All mediums are welcome. Artists who have previously participated are automatically eligible for entry in this year’s show. New artists: please contact us, to discuss your work and display needs. Art must be your own original work. Quality reproductions of originals by the artist are admissible, but must be labeled accordingly. The ArtWalk team reserves the right to decline any artwork that is inappropriate for our diverse audience. Sorry, no display items not created by the artist. Artwork must be labeled with title, artist’s name, and orientation noted (if applicable). 2D art must be dry and ready for hanging with matting, framing or rigid backing. The ArtWalk team will set up all exhibits. No brackets or clip-style frames, if possible. Matted prints assembled with hanging apparatus. Artists are responsible for delivery of their art as scheduled by set up team, artist and merchant. All artwork will be handled with extreme care, however, the Artwalk team is not responsible for any loss or damage. Childrens’ art will only be displayed, not sold. All artwork must remain on display until the end of the show. The artist will arrange delivery or shipment of any art sold. It is the responsibility of the artist to make arrangements with the sponsoring store to remove art on days scheduled for takedown. If a store is vacant or not open for business, the artist must contact the EAW staff to arrange pickup. Artists will arrange a time to pick up their work from the displaying store at a time of mutual convenience sometime during the days of February 18-19, 2019. All sales transactions will be handled by the EAW staff. The stores will not handle the sales. 100% of the selling price will be paid to the artist, after the show.